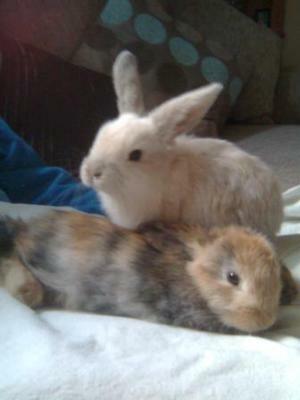 These are my two rabbits, Holly (cream) and Maisy (patchy brown), who I have had for six years now. I've always been curious about whether they really are mini lops (which the breeder claimed them to be), because they both outgrew her average measurements of a typical mini lop. She suggested they would grow to be about 20cm in length, but in reality they're closer to 30 or 40cm. They also weigh more than the average mini lop (I cannot remember their exact weight but both were just over the highest threshold for an average mini lop), although to look at them they do not look overweight and they get fed a very good diet, so this again makes me suspect they may be a different breed of lop. Reading a description of a typical mini lop character on this website again doesn't quite ring true. We've had them since they were both little, and handled them on a daily basis, but they've always hated being picked up (I handle them as recommended by a vet) and they tolerate a cuddle but they'd rather be outside and left to do their own thing on the lawn. If you try and pick them up from their hutch to put them in their run (or vice versa), they (particularly Maisy) are prone to being very grumpy, grunting and scrabbling/scratching at my outstretched hands. I've never really understood it- they've always had a huge hutch and run, they get regular attention, their favourite foods (they love kale, watercress, spinach and buttercup leaves in particular) and a treat in the evening too (usually a raisin or some 'woodland forage' from Petsathome). Their hutch is in a sheltered spot so they're not exposed to the elements (when it's cold, I put a couple of blankets around the hutch to keep them warm, although not on the run so that they have an area to go to if they're too warm), and the sun shines on their run (they love to sunbathe). Their teeth, claws and fur are all in good condition too. It's baffling. The only thing I can think of is perhaps they weren't kept in very good conditions by their breeder, but the breeder did seem a very respectable woman so even that I have doubts about. 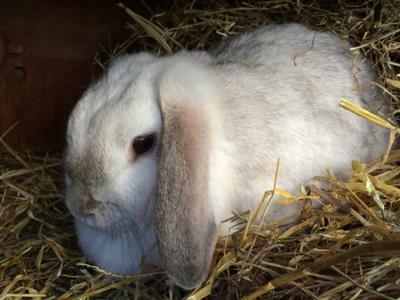 Comments for Definitely a lop- but which breed? 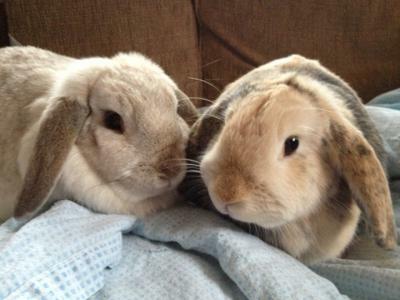 I think they look like French lops based on their face shape and size but I am not completely sure.